Each fall, fire ants slip quietly somewhere into the back of my greenhouse and take up residence. Usually, I do not notice them until I pick up a pot and get a few nasty stings. For those that have not experienced this garden pest, fireants are an imported species that has gradually spread across the Southeastern U.S. They have a very nasty sting, which they tend not to use until a large number of individuals have swarmed onto a pant leg where they all sting at once. They are easily eliminated with available pesticides. Many people are allergic to their stings, so, it is best to get rid of them whenever they are found in an orchid pot. Otherwise, they can get carried into the living room inside a prized flowering orchid. This year something interesting occurred when fire ants took up residence among a group of paphs that have been in my collection for many years. These paphs are nothing special from an award standpoint, but have sentimental value, because I used them to learn how to grow paphs. They are usually the last to be repotted or cared for unless I am using them for a new experiment. I had noticed the vigor of these plants this fall because the leaves were especially large and colorful. While watering heavily one day, I noticed that the base of the plant was covered with fine soil that I washed away. The next time I watered it was there again and I realized there were ants in the pot. Fireants had taken up residence among these old paphs and every paph was growing extremely well. Paphs are one of the few orchid groups that prefer continual repotting to keep them growing well. These paphs were in a mix of fine bark, peat, lava rock, and perlite that had exceeded its lifespan. Usually, newly repotted paphs in this medium grow very well for 4-6 months then growth slows until they are repotted. If not repotted by the end of a year growth stops and the plant declines or dies. The ant infested pots had reached the end of the annual cycle and were scheduled to be repotted. These paphs were growing in clear, plastic pots so it was obvious what had happened. The Fireants had increased aeration and drainage within the pots. Their droppings also likely increased the available nitrogen within the pot as well. The lesson here is not to import Fireants into your growing area, but that paphs need good aeration to grow well. In general, the problem with growing all orchids is that the medium tends to compact after several months leading to less aeration. The more dense and fine the medium, the faster compaction occurs. In nature, roots are attached to the outside of trees in the case of most epiphytes. 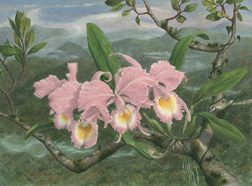 Orchids growing among the decaying leaves and stems on the ground, have earth worms and other insects to rework the medium in which they grow, as well as a constant supply of new material added as leaves and twigs fall onto the soil below. These are the conditions we try to replicate in our culture. Good culture recognizes the natural environment and cues found in the environment where orchids grow. When the sun is low on the horizon and solar radiation weak, many tropical orchids do not receive enough light to grow or flower well. Shading can now be removed with little danger of leaf burn except on the South side of the greenhouse or South-facing windows. Each growing area is a little different, so it may take a few years to get the optimum shading required for maximum growth without burning. I usually remove all shading around the Winter Solstice (21 December) when the days are shortest and sunlight least intense and add shading in late February or March as the sun gets higher. In winter, most phals need to be staked to keep the weight of newly opened flowers from breaking the bloom spike. Stakes can also be used to guide spikes if light direction is causing spikes to orient poorly. This can be a serious problem in window culture and even in greenhouses this time of year. The spike should be securely staked, almost to the first bud before it matures. The goal is to produce an inflorescence that arches gracefully away from the stake with each flower almost touching the previous one on both side of the spike, an orientation known as shingling. Multifloral phals should be staked differently. The objective is to stake the main spike vertically, so that the flowering branches can hang down and not touch flowers on the main stem. In locations, such as windows where there is little room for an arching bloom spike, standard phals can also be tied using this method. If older flowers drop as new flowers open every 3-4 days, there may be either a cultural problem, i.e. no roots, lack of water, etc, or an environmental one such as low humidity or unvented combustion gases.